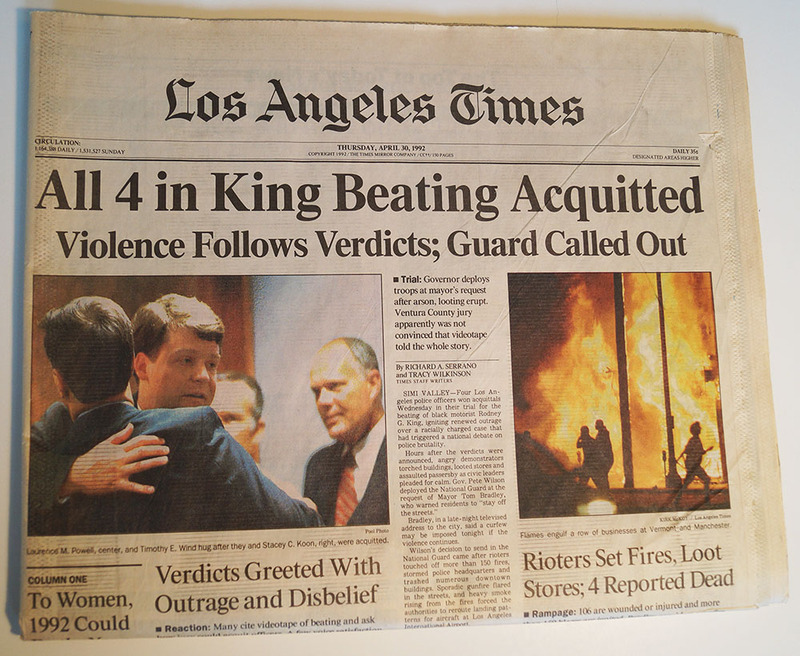 “All 4 in King Beating Acquitted” This is the COMPLETE newspaper from the acquittal of the 4 police officers charged with beating black motorist Rodney King. Newspaper is in great condition; a real time capsule. Rodney Glen King III (April 2, 1965 – June 17, 2012) was an American construction worker who became nationally known after being beaten by Los Angeles police officers following a high-speed car chase on March 3, 1991. A local witness, George Holliday, videotaped much of it from his balcony. The footage shows five officers surrounding King, several of them striking him repeatedly, while other officers stood by. Part of the footage was aired around the world, inflaming outrage in cities where racial tension was high, and raising public concern about police treatment of minorities. Four officers were charged with assault with a deadly weapon and use of excessive force. Three were acquitted of all charges. The jury acquitted the fourth of assault with a deadly weapon, but failed to reach a verdict on the use of excessive force. The jury deadlocked at 8–4 in favor of acquittal at the state level. The acquittals are generally considered to have triggered the 1992 Los Angeles riots, in which 53 people were killed and over 2,000 were injured, ending only when the military was called in. The acquittals also led to the federal government’s obtaining grand jury indictments for violations of King’s civil rights. The trial of the four in a federal district court ended on April 16, 1993, with two of the officers being found guilty and subsequently imprisoned. The other two were acquitted again.